Robert Dean Hales had begun to make preparations to leave his Scarsdale, New York, home to assume leadership of the England London Mission, following a telephone call from President Marion G. Romney. His wife, the former Mary Elene Crandall, would accompany him to England. His oldest son, Stephen Crandall Hales, was already there, serving as a missionary in the England Bristol Mission. His other son, David Crandall Hales, had made arrangements to live with an aunt and complete his junior and senior years at Skyline High School in Salt Lake City. Then came the second phone call. And Elder Robert D. Hales accepted the call to serve as an Assistant to the Council of the Twelve. But an examination of Elder Hales’ life thus far clearly demonstrates his preparation. He was born August 24, 1932, in New York City, New York, to John Rulon and Vera Marie Holbrook Hales. He graduated from Great Neck High School in Long Island, New York, where he was a member of the baseball team. “My father sat up in bed and said, ‘Don’t put all your eggs in one basket.’ But I never dated another girl after that,” Elder Hales recalls. 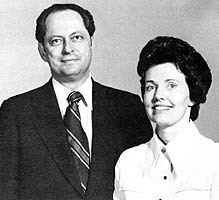 They were married June 10, 1953, in the Salt Lake Temple. Elder Hales graduated from the University of Utah in 1954, served as a jet fighter pilot in the United States Air Force, and received his Master of Business Administration from Harvard University in 1960. Elder Hales’ extensive business career and service in the United States Air Force have provided him opportunities to serve throughout the United States and in England, Germany, and Spain. Before joining Cheesebrough-Ponds, Inc., where he has been group vice-president until his call, he was vice-president of the International Max Factor Company, president of Hughes Broadcasting Corporation, president of the Paper Mate Company, and general manager of Gillette Safety Razor Division in Spain after serving as the company’s marketing director in England and deputy general manager in Germany. Elder Hales has had a varied and active life of service in the Church. He served as branch president in Albany, Georgia, in Weston, Massachusetts, in Frankfurt, Germany, and in Seville, Spain. He served as bishop in Weston, Massachusetts, in Chicago, Illinois, and in Frankfurt, Germany. He was a member of the stake presidency in the Boston Massachusetts Stake and on the stake high council of the London England Stake. He served as elders quorum president in Cambridge, Massachusetts, and taught morning seminary classes in Downey, California. At the time of his call to be an Assistant to the Council of the Twelve he was serving as Regional Representative for the Philadelphia and Pittsburgh Regions and Pennsylvania Harrisburg Mission.